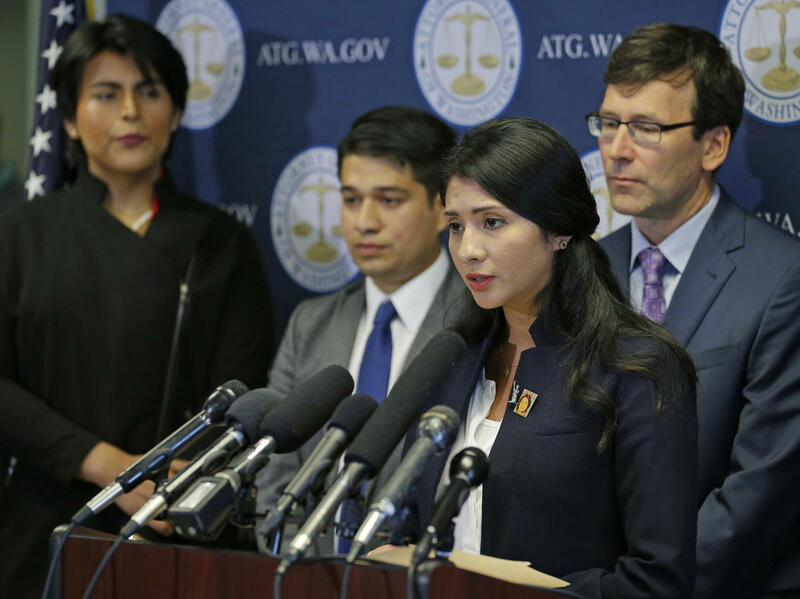 Faride Cuevas, a participant in the Deferred Action for Childhood Arrivals, or DACA, program, talks to reporters Wednesday in Seattle as Washington Attorney General Bob Ferguson and other DACA participants look on. Several states are suing the Trump administration to block it from terminating the program protecting young immigrants known as DREAMers. The lawsuit, filed Wednesday in the Eastern District of New York, was brought by the attorneys general of 15 states and the District of Columbia. All are Democrats. It follows the administration's announcement Tuesday that it would phase out the Obama-era program called Deferred Action for Childhood Arrivals, or DACA. U.S. Attorney General Jeff Sessions said DACA would end in March 2018 unless Congress takes action to salvage it. The move brought nationwide protests — and the lawsuit. Washington Attorney General Bob Ferguson, among those suing, says the Trump administration violated the due process rights of the young immigrants by failing to safeguard the personal information they initially gave the government in order to enroll in DACA. He fears that the information will be used to locate and ultimately deport the current 800,000 DREAMers and their families. "It's outrageous; it's not right," Ferguson said in a Seattle news conference. "As attorney general for the state of Washington, I have a hammer — it's the law." This isn't the first time Ferguson has clashed with the Trump administration. He sued earlier this year to challenge Trump's ban on travelers from seven predominantly Muslim nations. He and the other attorneys general say racial bias is also behind the move to end DACA. The states' lawsuit alleges that Trump violated the Constitution's equal protection clause by targeting a cohort that is nearly 80 percent Mexican natives. Citing Trump's numerous statements disparaging Mexicans as "criminals, thugs and 'bad hombres,' " Ferguson said Trump has revealed "a racial animus" toward Mexicans: "Ask yourself one question: If the overwhelming majority were Caucasians, does anybody really think he (President Trump) would have taken the action he took?" The lawsuit also argues that the individual states will be harmed by the potential deportation of thousands of tax-paying residents. The Department of Justice responded to the lawsuit by citing Sessions' argument in Tuesday's news conference — that phasing out DACA preserves the rule of law. Sessions and other critics of DACA say it is unconstitutional because former President Barack Obama created it by an executive action, rather than leaving the decision to legislators. "While the plaintiffs in Wednesday's lawsuit may believe that an arbitrary circumvention of Congress is lawful, the Department of Justice looks forward to defending this administration's position," said DOJ spokesman Devin O'Malley. DACA was born as a temporary workaround of Congress, which repeatedly had failed to pass comprehensive immigration overhaul. It offered certain young immigrants brought to this country illegally by their parents a deal: Come out of the shadows and provide the government with their personal information in exchange for protection against deportation and a renewable two-year work permit provided they are in school or the military and have a clean criminal record. One of four DACA participants calls California home. The state's attorney general, Xavier Becerra, is an outspoken critic of Trump and his policies but did not join the lawsuit. A spokeswoman said that although Becerra has worked closely with other state attorneys general, he will likely choose to take action independently because of the number of DACA recipients in his state. Other participating states in Wednesday's lawsuit are New York, Massachusetts, Connecticut, Delaware, Hawaii, Illinois, Iowa, New Mexico, North Carolina, Oregon, Pennsylvania, Rhode Island, Vermont and Virginia, plus the District of Columbia. Copyright 2017 NPR. To see more, visit http://www.npr.org/.